America needs to overthrow Syrian President Bashar al-Assad and wage war on Russia and Iran because of the Holocaust, so says National Security Advisor Lt Gen HR McMaster. National Security Advisor Lt. Gen. H.R. 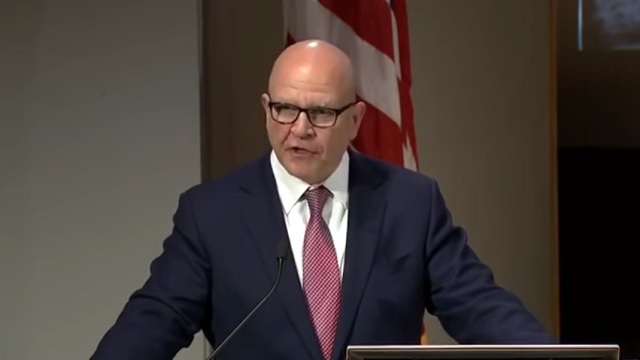 McMaster delivered a speech at the U.S. Holocaust Memorial Museum in Washington, D.C. on Thursday where he compared atrocities carried out by the Assad regime in Syria to the Holocaust. In addition to targeting the Syrian regime in his remarks, the national security advisor also called out Russia and Iran for assisting Syrian President Bashar al-Assad for strikes on civilians, using chemical weapons, not complying with ceasefires, and not allowing aid reach civilians. McMaster said the United States is documenting atrocities in Syria by the Assad regime for use in future prosecutions, fighting alongside partners such as the Syrian Democratic Forces to defeat ISIS, and providing aid to assist civilians. "Following Assad's April 4, 2017 sarin attack on innocents, President Trump launched a powerful missile strike on the Syrian air base from which this attack originated, destroying over 20 percent of the Syrian Air Force," McMaster said. "Our actions sent an unmistakable message: using these horrific weapons is never acceptable and we will hold perpetrators accountable." "Unfortunately, many of these life-saving efforts to resolve the conflict, to defeat ISIS, to deliver humanitarian aid, and to deter chemical weapons attacks are impeded by the Assad regime's sponsors in Tehran and in Moscow," McMaster said. "All civilized nations must hold Iran and Russia accountable for their role in enabling atrocities and perpetuating human suffering in Syria." On February 2nd, the same day the Nunes memo dropped, General Mattis quietly admitted the US has no evidence Syrian President Bashar al-Assad used sarin nerve gas against his own people. There's no way McMaster missed that news, he's just lying through his teeth. "The Russian government has bombed civilian areas and provided political cover for Assad�s crimes," he explained. "From February 24 to February 28, Russia conducted twenty bombing missions every day in the Eastern Ghouta and Damascus areas of Syria." "Russia has also repeatedly thwarted efforts by the OPCW to hold the Assad regime accountable for using chemical weapons." McMaster also discussed the chemical assassination attempt of a Russian defector and his daughter in the UK last week. "This morning, the United States, France, Germany, and the United Kingdom condemned the abhorrent nerve-agent attack on Sergei and Yulia Skripal that took place in Salisbury, United Kingdom on March 4," he said. "The statement made clear that we believe that Russia was responsible for this attack," he added. "And we call on the Russian government to answer all questions related to this incident and to provide full information to the OPCW." Russia called on Britain to provide them with a sample of the supposed Soviet chemical weapon Novichok they claim was used to poison Skripal (which could have been produced by anyone). Boris Johnson has said they'll allow the Organization for the Prohibition of Chemical Weapons to test the substance on Monday, but not Russia. The UK government said the results are expected to take a "minimum of two weeks." Putin said Sunday it's "nonsense and absurd to claim that Russia would do anything like that before the elections and the World Cup." �Concerning this tragedy that you�ve mentioned, I learned about it from the media,� Putin told reporters. �It�s an obvious fact, you should simply understand that,� he said. The Skripals, 66-year-old Sergei and 33-year-old Yulia, were found slumped on a bench in Salisbury on March 4. They remain in hospital, in critical but stable condition. ...�We have not seen this so far, but we keep that on the agenda while planning our bilateral work,� Putin said, adding that Russia is ready �to discuss any issues and overcome any difficulties" with London. Moscow does not possess any chemical weapons stockpiles, Putin said. We've seen this song and dance before. We went through this whole "war based on lies" deal in 2003 to disastrous effect. We're not going to do it again. Trump needs to make good on the sane foreign policy he campaigned on and fire this lunatic immediately.